KULT: Divinity Lost is a reboot of the highly acclaimed and infamous contemporary horror role-playing game “Kult”, originally released in 1991. This, the 4th edition of Kult, features a completely new rule-set based on the Apocalypse World engine, and the setting is updated to present day. Escape your nightmares, strike bargains with demons, and try to stay alive in a world full of pain, torture, and death. 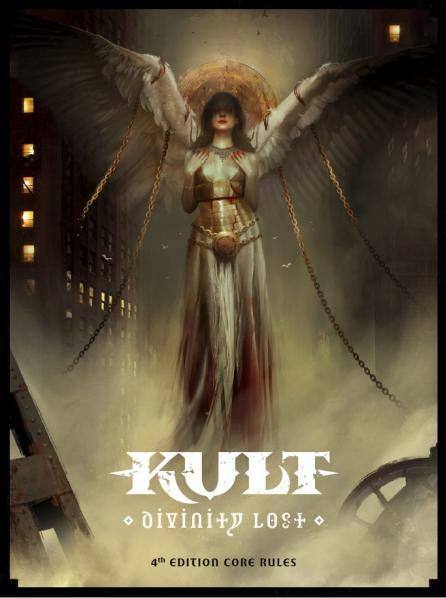 In KULT: Divinity Lost, the world around us is a lie. Mankind is trapped in an Illusion. We do not see the great citadels of Metropolis towering over our highest skyscrapers. We do not hear the screams from the forgotten cellar where hidden stairs take us to Inferno. We do not smell the blood and burnt flesh from those sacrificed to long forgotten Gods. But some of us see glimpses from beyond the veil. Made in the UK. Mature Warning: contains graphic and written content of a mature nature, including violence, sexual themes, and strong language. Reader discretion is advised.